It looks like Assassin’s Creed might be back on a yearly schedule, if a new leak is anything to go by. 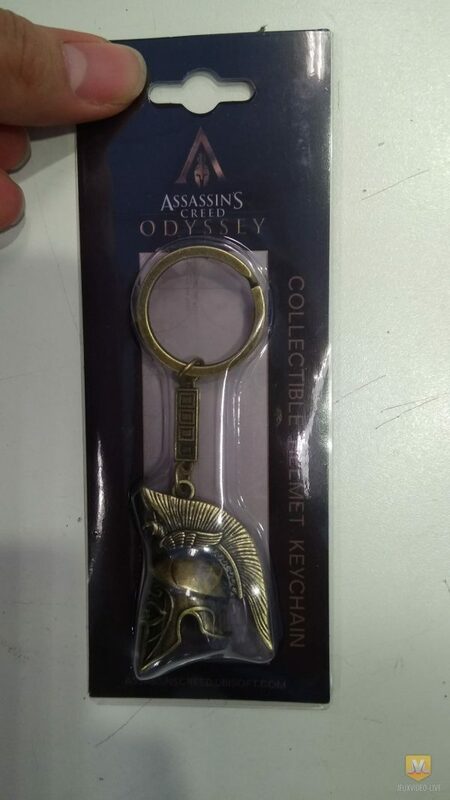 French gaming website Jeux Video Live obtained a picture of a keychain and its packaging, leaking the next Assassin’s Creed game before Ubisoft could officially announce it. The keychain is a Greek-style helmet and the packaging sports the logo for Assassin’s Creed Odyssey. While Ubisoft has yet to officially announce Assassin’s Creed Odyssey, if this is a fake, it’s a pretty impressive one. Jeux Video Live’s source sent the photo to reveal that Assassin’s Creed is headed to Ancient Greece, along with with title for the upcoming game. More importantly, this image seems to hint that we’ll be getting Assassin’s Creed Odyssey soon. It’s not likely that Ubisoft would be getting merch and swag ready just before E3 if Odyssey wasn’t 2018 game. Even if it is a 2019 game, expect this one to be one of the “surprises” Ubisoft reveals at E3, though it’s not much of a surprise anymore. This leak matches with a rumor earlier this year that said the next Assassin’s Creed game would be in Greece, though it indicated a fall 2019 release for the title. That report had a lot going for it, including one of the developers having snapped a picture while on a trip to Greece. This new leak holds a lot more weight as we now have physical proof of the game’s title and setting. The last game in the series was Assassin’s Creed Origins, released in 2017 after taking a year break to gain new footing for the franchise. That extra time led to Origins being widely considered the best Assassin’s Creed game released, breaking a lot of new ground. Do you think Assassin’s Creed Odyssey will be released this year, or will Ubisoft reveal it at E3 nearly a year and half ahead of a fall 2019 release? Do you like the Greek setting? Let us know your thoughts in the comments below.